MyGig Endless Restart Reboot Shut Down | Crash Freeze | RHR RER won't Start ! or just won't start up ? Remove your hard drive following the instructions below to see if that solves the problem. Your system should start up normally and play Radio (AM / FM) without the drive. Most other features will not work during this test. If your MyGig system constantly restarts, crashes, freezes or just won't start up with its hard drive connected, but will start up and play radio channels normally with the drive disconnected, you can be fairly certain your hard drive is the problem. Occasionaly we see systems that will constantly reboot with any drive connected but work without a drive, but most often this test provides valid results. To perform this test, create temporary support for your MyGig just below the opening in the dashboard like shown in the photo below. 2 big folded beach towels is enough for this 2013 Jeep Grand Cherokee. This will allow you to complete this test without disconnecting all the cables from the back of your MyGig or without sliding the MyGig head in and out of your dashboard for each phase of the test. You can run the radio-test with your system upside down as shown. An 08 Torx drive is required to remove the hard drive from most MyGig units - some production runs used other Torx sizes. Instructions: Test to see if your MyGig will boot up and play (AM / FM / Sirius) after you disconnect your hard drive. 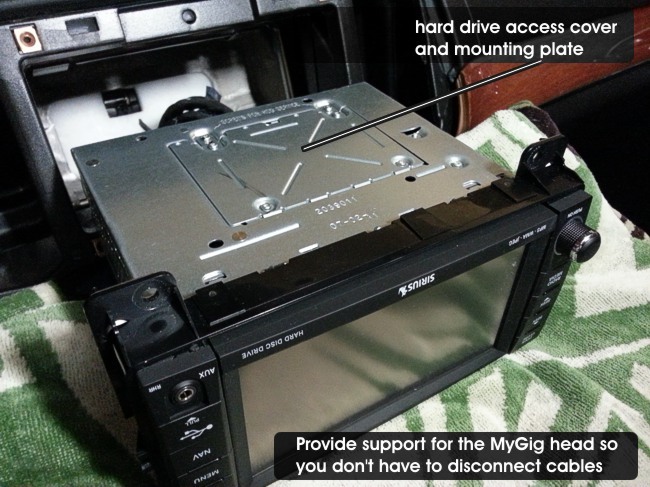 Make a workspace to support your MyGig unit like in the photo below - so you don't have to disconnect all the cables. Disconnect the cable from the negative connector on your car battery - your MyGig is always powered. 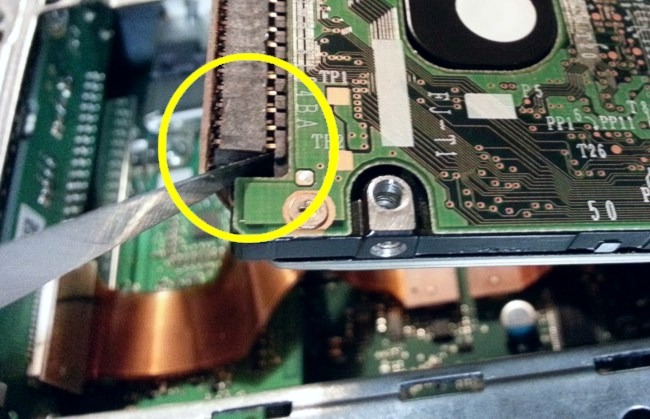 Remove the hard drive from your system. See photos below. Don't pull on the hard drive cable or the IDE connector. Use a sharp pointed knife underneath the ends of the connector as shown. If the unit starts normally, and plays your radio stations without a hard drive, your hard drive is causing the problem. If the unit is still has the same problem without its hard drive, your system needs replacement or professional service. If having your hard drive connected proves to be the cause of the Reboot, Freezing or Crashing, in most cases this means you need to restore or replace your hard drive to get your system back to its original working configuration. Select your MyGig model on the tab-menu above. If your system has the same problem with the hard drive removed, there is no do-it-yourself solution. The unit will have to be exchanged through your car dealer or repaired by a Navigation System Repair company. When you reconnect your drive, be careful align the connector as shown. Its very easy to plug the connector in wrong, shifted left/right or inverted.